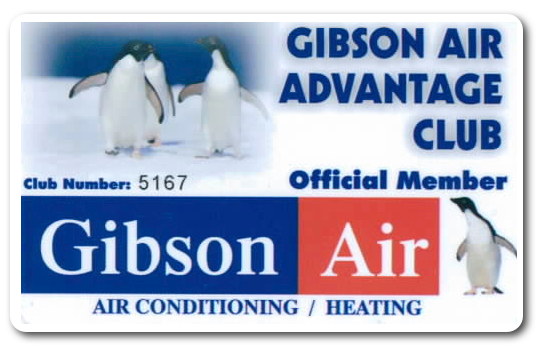 Sign up for HVAC Maintenance Contract or spend $500 on purchases to receive benefits with Gibson Air Advantage Club Card! At Gibson Air Conditioning and Heating, we value our loyal customers for the trust and confidence they place in our services. To insure that our customers receive the highest quality of service they deserve as rapidly as possible, we have implemented the Gibson Air ADVANTAGE CARD. Each new customer who spends over $500 or purchases a HVAC Maintenance Service Contract will receive an Advantage Card in the mail. What Benefits Do Advantage Club Card Members Receive? Discounted labor and parts pricing. No overtime rates after hours or on weekends or holidays. Discount pricing for all new equipment. Eligibility for quarterly drawing for free equipment/prizes. Eligibility to receive a referral reward for friends/neighbors purchases. Notification of all special promotions offered by Gibson Air. How To Activate Your Advantage Club Card? After your initial service with Gibson Air our staff will mail you the ADVANTAGE CARD as well as a copy of our referral program information. All you have to do is call our office at 702-388-7771 to register your card. Then you can begin to enjoy all the perks that are associated with it and our referral program! Each time that you call for service, mention that you are an ADVANTAGE CARD customer to ensure you receive the benefits associated with this card!